Ganges is the most important river of India. Both in terms of religion and geography. With a length of 2,525km, Ganges is the longest river of India. It is also the third largest river in the world in amounts of water discharge. 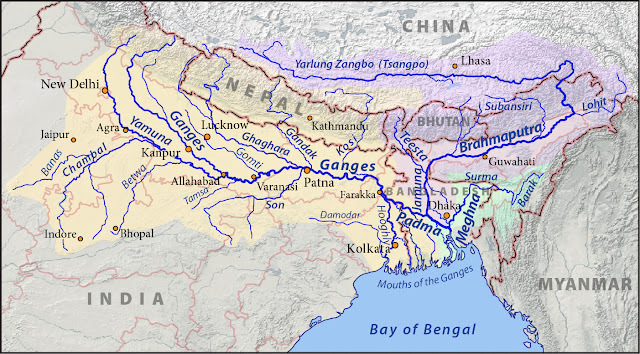 Ganges basin covers four countries - China, India, Bangladesh, and Nepal. It flows through Indian states - Uttarakhand, Uttar Pradesh, Bihar, Jharkhand, and West Bengal. Ganges is the most sacred river of Hinduism. It is worshiped as goddess Ganga. It is believed that water of Ganges purifies the soul and diminishes sins of a person. Farakka barrage is the largest barrage on Ganga. It was opened on 21 April 1975. It is built near the place where Padma enters Bangladesh and Hooghly continues its flow in West Bengal. Other important barrages built on Ganges are Tehri Dam, Bansagar Dam. 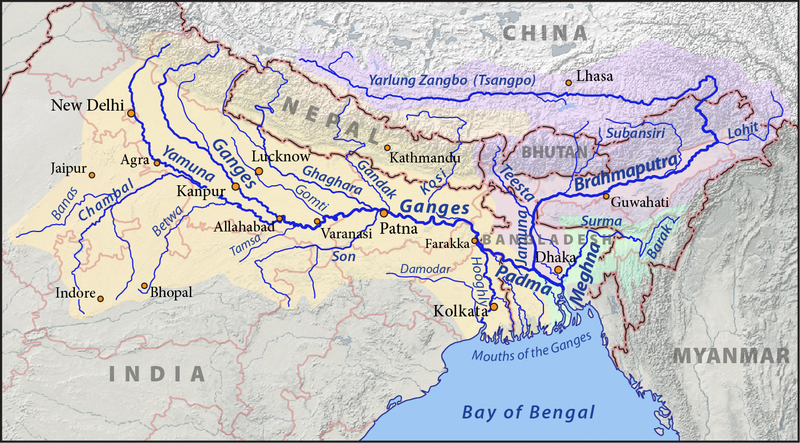 The Ganges delta is the largest delta of world. 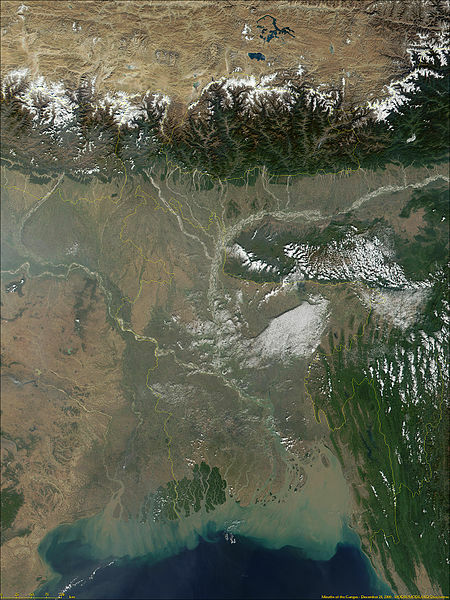 Ganges basin is the most fertile land and it is used for agriculture. It is the home of many fishes and aquatic animals. Ganges dolphin and Magar crocodile can only be found in Ganges. But there numbers are reduced very much and they are declared as endangered species. It was ranked 5th in the most polluted rivers category in world. Many plans were made to clean up the river but due to its vast basin most of them failed. ⬇Ganges is the confluence of six water streams- Alaknanda, Dhauliganga, Nandakini, Pindar, Mandakini, and Bhagirathi. The source of Bhagirathi is gangotri glacier of Gomukh. ⬇The five water streams joins the alkananda at five points. This five confluence points are called Panch Prayag. These panch prayags are - Vishnuprayag (Dhauliganga joins the Alaknanda), Nandprayag (where the Nandakini joins), Karnaprayag (where the Pindar joins), Rudraprayag ( where the Mandakini joins) and Devprayag (Where Bhagarithi meets). From Devprayag, it become Ganges. ⬇Ganges flows through the narrow himalayan valley till Haridwar. After that it enters the wide gangetic plain. From this point, it changes its direction from south-west to south-east and enters into the Indian state Uttar Pradesh. ⬇In Uttar Pradesh, the river passes through the cities Kannauj, Farukhabad, Kanpur. At Allahabad, ganges meets with the tributary river Yamuna. The meeting point is known as Triveni Sangam. ⬇After completing its course in Uttar Pradesh it enters into Bihar. Ganges largest tributary river Ghaghara meets with it in Bihar. Other tributary rivers Son, Koshi, Gandhak also meets it during its course in Bihar. ⬇In Pakur, Jharkhand, Ganges gets divided into two branches - Bhagirathi-Hooghly and Padma. ⬇Bhagirathi-Hooghly river flows through West Bengal and later known as Hooghly River. It flows in the southern direction. Damodar, the longest tributary of Hooghly, meets with it in West Bengal before it empties it self in Bay of Bengal. ⬇Padma river enters Bangladesh and later empties itself in Bay of Bengal. During its course in Bangladesh, it meets with the two biggest distributaries of Brahmaptra, Jamuna and Meghna.